A good design means efficient manufacture, straight-forward installation and ultimately, good value. At TensileFabric we are always focused on the design of your fabric structure, making sure it has the right shape, is supported by the most appropriate frame, and is therefore the best overall solution. Fig. 1 - Initial sketch drawingAt the early stages of the enquiry, we will ask you about the form that you would like the fabric canopy, fabric screen, or ceiling to take, and whether it should be hung, self-supporting, or appear to be floating etc. We do this to make sure we fully understand your expectations, so we can begin to outline a form that works perfectly for you and the application. This briefing process results in a sketch which then, as well as being costed, can be discussed with the client and all other parties involved. The drawing below shows a typical simple example. Fig. 2 - Example Design proposalFrom the sketch drawings, design development then continues, working out specific forms, interactions of the steel and fabric, water run-off etc. This culminates in a complete design proposal that is ready for sign-off by the client. The example below shows extracts from a drawing for an exterior canopy, where the canopy has been built in 3D CAD to allow the client to discuss with their ultimate client/ main contractor/ planners. Budgets are then set, costs are provided and, if everything is agreed upon, the process continues to fabrication level. Obviously included in this is the development in 3D of the fabric form, with industry-specific fabric form development software, using fabric panel shapes to create the appropriate form. Fig.3 - Snow load analysis of a tensioned fabric formThis is developed in conjunction with our engineers in order to avoid excessive load, be it wind, snow or physical weight. All parts are drawn individually, and made ready for fabrication by the various in-house and subcontract Fig.4 - Typical clamp plate drawing for fabricationservices employed by us to create the fabric structure. Finally the canopy parts are assembled at our works for delivery to the site and installation. Fig.5 - Completed canopyTo complete the design process at this stage, setting out drawings are checked to make sure they include every last detail for the installation teams, so the installation runs smoothly and to the method statement. As you can see, our design process is comprehensive, traceable and thorough, such that we can be sure to provide you with a canopy that is well thought out every time. 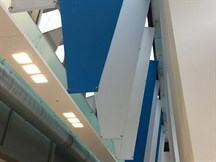 We helped another office building sort out their sun glare problem with some strategically placed fabric fins. 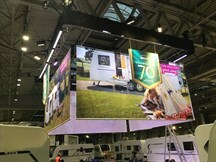 Another successful install for MMA Pro for Bailey Caravans at the NEC!